A company executive team has been built up consisting of, among others, Erling Frydenberg for hotel operations; John Rusten as head of development and new construction; and Richard Goodwin as director of engineering. Frydenberg served most recently as vice president of hotel operations with SeaDream and has previously held similar senior executive positions with Silversea, Disney, Crystal and Royal Viking Line. Rusten was in charge of Disney’s first newbuildings and has also worked for American Classic Voyages, Kloster Cruise and Fred. Olsen & Co. Goodwin comes from Lloyd’s Register where he was manager of passenger ships. Viking River Cruises, with sales offices in Los Angeles and London, and operations in Basel, owns and operates some 39 riverboats in Western Europe, Russia, China, Egypt and Vietnam. “I started with two empty hands 15 years ago,” Hagen commented. “We acquired our first boats in Russia. Since then we have spent some $350 million on marketing and sales, plus agents’ commissions, and it is we that have built up the popularity of river cruising.” Eighty to 90 percent of Viking River’s passengers come from North America. 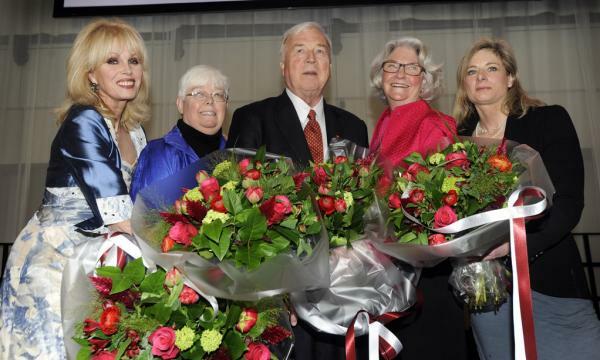 Photo: Torstein Hagen with the four godmothers from the Viking Longship christening in March: Joanna Lumley, Gail Wiswedel, Rebecca Eaton and Professor Lisa Randall.